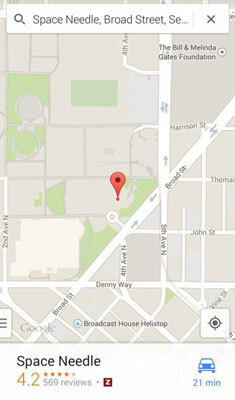 Tap the Search text box and enter the name or address of your desired location: for example, Seattle Space Needle. Tap the Directions icon of the Device Function keys and enter Seattle Space Needle in the Choose Destination line. Tap the Services icons, tap the Attractions icon, and select your location. Any of these three methods will lead you to the map showing your location. You might expect that searching for a specific attraction (such as the Seattle Space Needle) will give you only the Seattle Space Needle, but sometimes you end up with several choices. Reduce your options by tapping the selection you want. To get directions, tap the icon with the blue silhouette of a car. This will give you directions which take into account that you are driving. Tapping other icons, such as the bus, give you directions based on using public transportation. 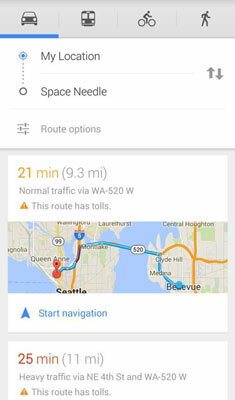 You can have the driving directions from the Bellevue City Park to the Space Needle. Tapping Start Navigation gives you step-by-step directions — it monitors where you are as you travel and tells you what to do until you arrive at your destination. If you want directions for walking, bicycling, or public transportation instead of driving, tap the map menu bar and click on the mode of transportation you want to use.